A man assaulted on a path in Wigan only later realised he had been stabbed twice as he staggered for help. Shortly before 5.30pm yesterday, police were called to reports that a man had been assaulted in Laithwaite Park. The 33-year-old man had been walking down a path when two men brushed past and told him to watch what he was doing. They then assaulted the man repeatedly and as he ran away from the duo - he realised he had been stabbed twice. The man reached a nearby pub on Harrison Street and called for help. He was then taken to hospital for treatment, where he remains in a serious condition. 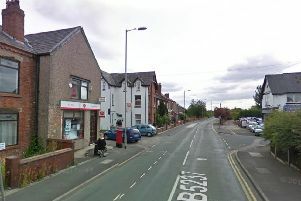 Detective Inspector Graham Clare of GMP’s Wigan borough, said: “To be subject to this kind of assault, in broad daylight, is absolutely terrifying and I wish the man a speedy recovery. “We are doing all we can to find the people responsible, but need the public to come forward and help us with this. Anyone with information is asked to contact police on 0161 856 7124 quoting incident number 1510 of 03/04/18. Reports can also be made anonymously through the independent charity Crimestoppers on 0800 555 111.